Hey guys! Hope you had a wonderful Thanksgiving! 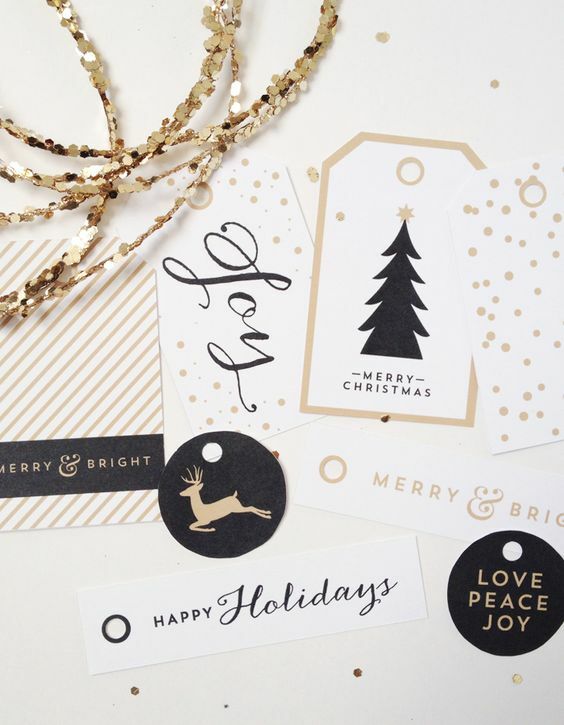 Since we're in the season of giving, and Christmas is right around the corner, I’m sharing some festive Holiday gift tags to help pretty up all those gifts under the tree. Just print them on a heavy cardstock, trim to size and string with some pretty ribbon. You could also write a message on the back for a more personal touch. THANK YOU to everyone one who spread the word about these little tags! please visit my new website, Union Shore for the links and NEW tags! These are gorgeous! Happy Thanksgiving! I love these tags! I definitely want to use them for my holiday gift wrapping. Oh they are BEAUTIFUL, thank you so much for sharing! I always struggle with finding cute and quirky tags and these are just perfect! Just shared on my Facebook page. Gotta change out my ink cartridge now so I can grab them for myself :) Thank you!!!!! So pretty! I love the black and gold, thats so you! So pretty!! I love your designs Jess! jess I saw these on Craftgawker this morning and just knew it was you - perfection in your photo styling as always! I love this idea so much!!! Thanks for these wonderful printables! These are wonderful! Thanks so much Jess!! These are wonderful!! My presents will look très chic with these black and gold tags! i absolutely looove these. definitely going to download some and use them. i really hope to bake some cookies and send them off to family and friends! thank you for sharing! Lovely blog, I follow you on Bloglovin. Oooh you've just made my Christmas a little merrier with these cute tags :-) Great job, Jess! These are so pretty, thank you so much! Thanks for sharing ! Beautiful! Thanks Jess! They are so cute! I'm definitely printing all of them out! Just printed all these super cute tags. Thanks so much for sharing! by fair, the cutest and most chic tags i've seen! Thanks you so much - these are great! Best I've seen for a long time!! Thank you!! Glad to hear that everyone still loves them! These are so beautiful. Thank you so much!!!!!!!!!! I hope all this goodness comes back to you. Thank you so much! Have a happy xmas! Thank you so much for sharing! Happy Holidays!